Our Gift Set also comes with a facial groomer. 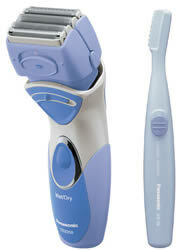 The perfect compliment to our Close Curves™ ladies' shaver. Both items are great for taking care of a woman's grooming needs. Our top-of-the-line ladies shavers feature an adjustable pivoting head for an ultra-close shave on hard-to-reach areas. The pivoting head rocks up and down, and back and forth, to follow the contours of your legs and underarms--while the shaver head moves with the curves of your body for a smoother, closer shave. You can also adjust the amount of pivot based on your shaving preference with the Pivot Action Selector. These shavers cut with the sharpest blades available on any ladies electric shaver for safe, ultra-close shaving. Our ladies shavers use hypo-allergenic stainless steel blades and foils for sensitive skin. Our shavers are fully immersible in water for shaving with lather in the shower or tub. You can also try it dry for a quick shave on the go. When you're done shaving, simply rinse clean under water. The pop-up trimmer can be used on the bikini area and for longer hairs. Just pop up when ready to use and slide back down when you're finished. This page is part of GeneralManual.Com Network Panasonic ES2208CMB Ladies Shaver/Trimmer User Manual.